Lenna of Hobart is a 4 star heritage listed hotel offering first class Queen Hotel Rooms, King Suites & luxurious 2 Bedroom 2 Bathroom Penthouses located in in the heart of historic Battery Point amidst the colour of Sullivans Cove, just a stone's throw from fashionable Salamanca Place and the Hobart city centre.Tasmania's rich heritage is beautifully preserved in harbour side Battery Point. 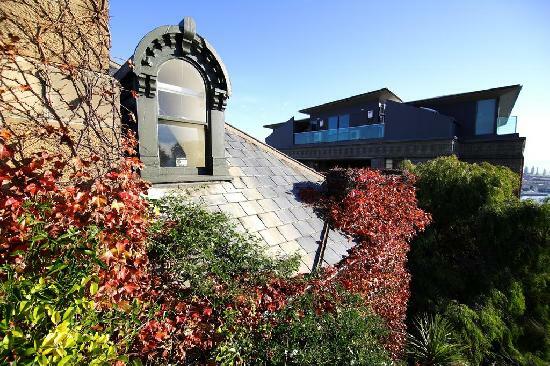 It is here on the southern end of Salamanca Place that Lenna of Hobart provides a unique combination of traditional elegance, modern accommodation and first class attentive service. Nearby Attractions : A popular Hobart landmark, Lenna also enjoys a unique location within an easy walk to many of Hobart's key visitor attractions including Battery Point Historic Village, Salamanca Place & Markets, Sullivans Cove Waterfront, Harbour Cruises, Tasmanian Museum & Art Gallery and Hobart CBD. Also the following popular attractions are readily reached by car, coach or boat cruise including Mount Wellington, Mount Nelson, Historic Richmond, Tasman Peninsula & Port Arthur, Derwent Valley & Mt Field National Park, Huon Valley & Tahune Air Walk, Hastings Caves & Thermal Pool, Cadbury Factory Tour, Southern Winery & Vineyard Tours. 2 Bedroom 2 Bathroom Penthouse : Sleeps up to 4 guests on 2 King Beds. Harbourview Hotel Suite -1q+2s : Sleeps up to 4 guests on 1 Queen And 2 Singles Beds. Harbourview King Hotel Suite : Sleeps up to 3 guests on 1 King Bed + Rollaway Bed Extra. Harbourview Queen Hotel Room : Sleeps up to 3 guests on 1 Queen + Rollaway Bed Extra. Mountainview Queen Hotel Room : Sleeps up to 3 guests on 1 Queen Bed + Rollaway Bed Extra. Parkview Queen Room : Sleeps up to 3 guests on 1 Queen Bed + Rollaway Bed Extra. Queen Hotel Room - Advance : Sleeps up to 3 guests on 1 Queen Bed + Rollaway Bed Extra.